Agent-Based Models are useful to describe and understand social, economic and spatial systems' dynamics. But, beside the facilities which this methodology offers, evaluation and comparison of simulation models are sometimes problematic. A rigorous conceptual frame needs to be developed. This is in order to ensure the coherence in the chain linking at the one extreme the scientist's hypotheses about the modeled phenomenon and at the other the structure of rules in the computer program. This also systematizes the model design from the thematician conceptual framework as well. The aim is to reflect upon the role that a well defined ontology, based on the crossing of the philosophical and the computer science insights, can play to solve such questions and help the model building. We analyze different conceptions of ontology, introduce the 'ontological test' and show its usefulness to compare models. Then we focus on the model building and show the place of a systematic ABM ontology. The latter process is situated within a larger framework called the 'knowledge framework' in which not only the ontologies but also the notions of theory, model and empirical data take place. At last the relation between emergence and ontology is discussed. The idea developed in this contribution is that a well defined ontology, based on the crossing of the philosophical and the computer science insights, can contribute to solve such questions. Each conceptual framework or model is grounded on ontology but the latter is generally not explicit. Furthermore, each step in a modeling process, the theory as well as the empirical analysis and the computing, involves implicit ontological implications. The point is then to explore these implicit ontologies underlying a given study. The domain related to that kind of question concerns the philosopher, as well as the expert of an academic domain (hereafter called "thematician'") and the computer scientist, but each specialist will address it differently. Our proposal is based on the crossing of these different fields. 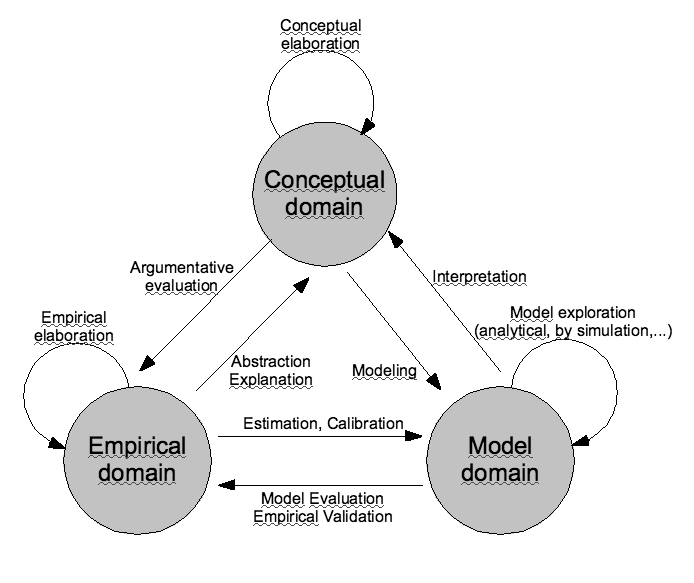 The hypothesis is that making more explicit the ontologies which intervene in a modeling process is useful to evaluate and compare different models of a same empirical question as well as to ensure the coherence among the thematician’s conceptual domain up to the implemented computer model. According to the « semantic » epistemological framework (Suppes 1989), a theory is related to empirical data through models that specify the parameters of the theory, and apply it to a particular domain: theory- models-empirical data. At each of these steps, we have ontological implications. Most often the ontology is not formalized, and its relations to theory, model and empirical data neither are. A few typical situations can appear. Different theories and models can be in competition to explain a "real world" phenomenon of interest. The question is then to investigate their relative relevance. Two modelers can manipulate what they a priori think is a same object of investigation, when a deeper analysis shows different underlying semantics. On the other hand, different disciplines may consider a priori different objects and relations which in fact can be articulated and even merged. Furthermore, in the same academic field, different computer programs may be coherent but rivals for translating a model. All these cases are classical when developing models in social sciences, but often they are not explicitly identified, which can lead to confusion in the interpretation. In all cases, making explicit the underlying ontology will help to find out the compatibility of models expressed in different languages (computer and thematic for example), as well as to value the similarity or dissimilarity between differently defined models and objects (in economics and geography for example). In order to provide a convenient, systematic and coherent framework for model design, we introduce then that we call a knowledge framework. It is compound of three related domains (see figure 1) (1) the empirical domain, (2) the model domain and (3) the conceptual domain. The empirical domain is the realm of observations and measures. It is both shaped by the observational practices (experimentation, data recording, interviews, etc.) and the underlying world view of the thematician defining what these observations or measures are about. The model domain includes formalized representations (differential equations, logical assertions, computer programs, etc.) which are (as any representation and like all observations) about what the thematician wants to explain. 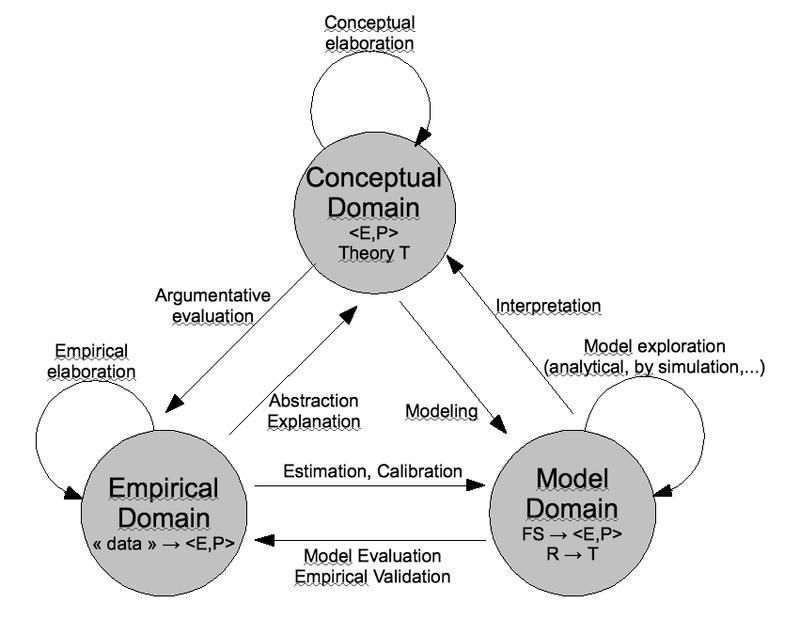 To make explicit the underlying world view defining (at least locally) the models and the observations are about, we introduce the conceptual domain which is essentially the theoretical background underlying the modeling process. A number of practices are organized around these three domains. For example, further empirical data can be elaborated from primary data, the conceptual domain can be subject to generalization or refinements and the models can be explored either analytically or by simulation (as it is often the case for MAS), models can be calibrated using empirical data and interpreted in terms of the conceptual explanation that it supports. In practice, some scholars use models as an "engineering tool" of investigation with only some empirically stated "constraint on the operations" without theory (Livet 2007) and/or within an interacting heterogeneous models framework (Phan et al. 2007), so mainly along the horizontal axis. There is no reason to assume that the ontologies underlying the empirical domain (what we are observing or measuring), the conceptual domain (what the theory is talking about) and the model domain (what the model is talking about) coincide, nor are even coherent with one another. Therefore, we have to turn into an explicit form the ontologies in each domain. Finally, these domains can be more or less invoked or formalized depending on the scientific discipline. A third question of interest concerns the ontological implications of emergence in agent-based models. When a micro-level of interacting agents in an environment is articulated with a macro-level of emerging patterns, emergence is necessarily defined relatively to the observational position of an observer that can be external (i.e. scientist) or internal to the ABM system. We have then to show how the ontological levels are articulated. Is it a same ontology which ensures the different roles or are there distinct ontologies, each one being related to a particular step of the modeling? The first case requires a more general representation; the second one necessitates to develop a correspondence table. And going further on, one can imagine a hierarchy of interacting objects, each one corresponding to an observation level. 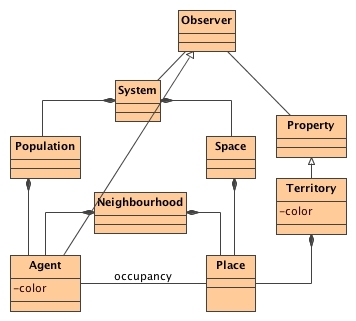 The rules governing the interactions between the entities referring to one layer (spatial entities for example) are then of different nature than those determining the interactions between entities of another layer (individuals in most applications in Social Sciences), each of them being associated to different forms of emergence. At each level raises the question of the ontological status of the entities: is there a new model and a new ontology, that subsume previous ones? Are they associated to either syntactic novelty (new emergent relation) or semantic novelty (new emergent entity) - or both? In this later case, what could be new kinds of interactions among such new entities or between these new entities and the older ones as well? The aim of this contribution is to discuss these different questions, to show how they are related, and to examine how an explicitly defined ontology can help the process of model building. First the different conceptions of ontology are presented, the "ontological test" is introduced, and its role to compare theories and models is stressed and illustrated (section 2). Then we focus on the model-building phase and show the place of an ABM ontology as a systematic knowledge framework on an empirical domain (section 3). At last the relation between emergence and ontology is discussed (section 4). Ontology has been one of the leading domains of philosophy for a long time. For the contemporary philosopher Barry Smith (2003), ontology is "the science of what is, of the kinds and structures of objects, properties, events, processes and relations in every area of reality"; in a broader sense it refers to the study "of what might exist". Then, defining an ontology consists in analyzing a domain, identifying the pertinent ontological basic elements (objects, qualities, properties, relations, processes), and the operations on these ontological elements. An example in geography would be to consider cities as objects, their economical and social characteristics as properties, the distance between them as relations, the operations consisting then in measuring these distances and in expressing their role on moves or exchanges between the cities. 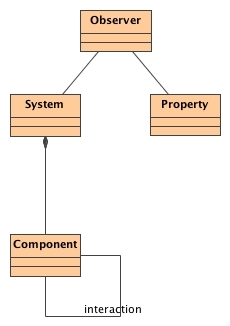 Ontology puts constraints on the concepts that we are entitled to use in a domain (for example, concepts implying continuity cannot be applied to discrete unities)..
More recently, the term ontology has been imported in the fields related to computer science, such as software design and model engineering, artificial intelligence and knowledge management (semantic web, information architectures, data organization...). An ontology is then a specification of a conceptualization of a given domain (Gruber 1993) and it deals, roughly speaking, with the formalization of the objects of knowledge in that domain: abstract types of ontological elements or objects are defined, together with their operations. Concepts of the "thematic" theories associated to this domain have to be designed in order to be able to describe and to explain the behavior of these elements in accordance with their relations and operations. There are two small differences with the ontology of philosophers: for philosophers, objects are not necessarily the basic ontological elements (substances or particulars or processes can be) and concepts are not themselves ontological elements, but our ways to apprehend entities. On the other hand it is an advantage to also give an ontological basis to concepts. Globally, the aim of the philosopher is to get as general as possible, to be able, with as few categories, to consider as many cases as possible, when the computer scientist’s point of view is more specific and engineering oriented. We propose the concept of "ontological test" for dealing with the question of the ontological compatibility between theories, models and phenomenological facts, or in other words between formal (or informal) doctrines, implemented "model world" and "real world", from an argumentative point of view. It necessitates first to make explicit the relation between theory and ontology and to show how to compare different theories on the one hand and different ontologies on the other. The "ontological test" represents a tool, that helps for such comparisons and ensures coherence in the model building process. The idea is that ontology can be used as a test, in analogy with the problem of translation between two languages. When two sentences in two different languages are about the same objects and their situations, these objects and their situations are our benchmark for assessing the reliability of the sentences that express the same situation in the two languages. For example, if we model social facts as the subsumption of situations under norms, and do not take cognitive agents but only social roles as members of the situations, our ontology is incompatible with a change of the situation triggered by the fact that some individuals have misunderstood the norm (which implies to have a cognitive activity). In order for the two descriptions to be compatible, our ontology in that case has to take at least cognitive processes as members of the situation.. When the ontology is defined in a general and broad way, it can be used as a benchmark and serve for comparing theories and models, even when they are developed in different disciplines. Indeed a coarse grained ontology, corresponding to a quite general definition, will be compatible with different theories. In that way, different theories or models may have the same ontology. With a more precise (fine grained) formalization, the ontology will serve to ensure coherence between the different structures of representations corresponding to the conceptual, model, and empirical domains, or to compare two competing models referring to a same field. These approaches are complementary and should follow each other when developing a model. In a first step, a coarse grained ontology in order to explore the implications of a theory and reflect on compatibility between computing and thematic models, between domain of reality and model. In a second step, a fine grained ontology, when the model is developed and stabilized. It can then be used to make comparisons with other models. Let’s take the example of Schelling’s model of segregation in order to clarify these notions (Schelling 1978). The studied phenomenon is segregation, which is commonly observed in the "real urban world" and studied by sociologists, geographers and economists. Schelling's aim was to explain how segregationist residential structures could spontaneously occur from local rules of behavior (individual preferences for living in a local neighborhood where individuals of other category than themselves do not exceed a certain threshold), without external intervention, even when people are not so very segregationist themselves. For Sugden (2002), Schelling "is declaring his confidence that this approach is likely to work as an explanation even if he does not claim so to have explained anything so far. (..) He constructed imaginary cities, which could be viewed as possible cities, alongside real cities. We are invited to make the inductive inference that similar causal processes occur in the real cities". This explanation is based on the hypothesis that individuals do react to the composition of their neighborhood according to a given threshold. The figure 2.1 illustrates this case where the system is composed of a population of agents and a space made of places occupied by the agents which can have different colors. The agents' movements is only based on the neighbourhood. Only an external observer notices that the space is decomposed into territories of the same color. A competing explanatory theory may refer to communalism and identity building, whose modeling would imply agents having a representation of the structure of their environment. 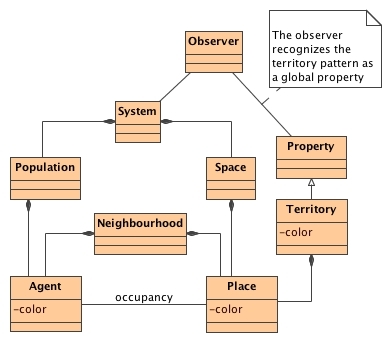 The figure 2.2, using simple UML diagrams for representing ontologies (Bommel and Muller 2007), illustrates this case by stating that an agent is also an observer, being aware of the partitioning of the space into uniform color territories. Accordingly, its decision can take this fact into account. The phenomenon under study is then the segregation, but the ontologies of the two explanations are different. For the first explanation, it implies an individual sensitivity to the proportion of dissimilar neighbors (the threshold of this sensitivity is given by the theory or by the model). For the second, it implies that agents have a territorial representation and a sensitivity to living within a black or a white territorial community. Both theories consider a same phenomenon, that of segregation, but they tell different stories. In fact, this situation can be interpreted in different manners, depending on how the underlying ontology is defined. 2.2. Global- cognitive cultural ontology for the segregation problem. The preceding example underlines that a thematic question can be explored and modeled within different theoretical and ontological backgrounds which have to be made explicit. Sometimes the modeler can start with one framework and choose to change it. Indeed, from a theoretical point of view one can distinguish several abstract situations, which can lead to change the predefined ontology and/or theory. As an illustration we present two cases based on the above segregation example: the starting point is a single empirical phenomenon and it’s a matter of choosing ontologies to develop models. Case (a): we have two different conceptualizations (possibly developed into two theories) of the same phenomena, each implying a different ontology. In the example above this phenomena would be segregation and the ontologies refer either to reactive agents with threshold of sensitivity to neighbors, or to cognitive agents having collective representations of territorial entities emerging at a meso-geographical level. Instead of keeping the two ontologies in the frame of one thematic description, we chose to develop two theories, exploiting the ontological differences: in the first case we have a theory of local decisions, and in the second one, at a different scale, a theory of collective cultures. Case (b): the starting point is the same, but one decides instead to build a single ontology. Indeed, we may choose to stick to an individualistic framework and a reactive agents model, and try to reduce collective representations to individual sensitivities. We have then simple reactive agents and rules which define the relation between a sensitivity threshold and a collective representation. It must be underlined that this would not be possible if one wants to introduce the hypothesis of a dynamic collective representation in the model to be developed. In each one of these two situations, to define what is the assumed ontology of a theory is a useful tool for asking whether two theories are basically similar and have to merge, or whether one theory has to be divided if it can for example be expressed through different ontologies, or whether the supposed object of the theory is really homogeneous. The interesting point is that one only needs a "coarse grained " ontology to explore such questions. In this framework the ontology is independent of the theory, and this feature makes it a good tool for comparison. The expected result of such analysis is to create a favorable scientific context for the next step, the building of a systematic ontological theory. In this section we focus more directly on the model-building phase within the ABM framework using the knowledge framework informally sketched in the introduction. If the conceptual domain and its use for ontological tests have been described in the previous section, it remains to produce a formal account in order to make explicit its relationships with the model and empirical domains. Let us start with the relationship with the model domain. In the agent-based simulation community, a frequently quoted definition of "what is a model" is the one of Minsky (1965): "To an observer B, an object A* is a model of an object A to the extent that B can use A* to answer questions that interest him about A". The researcher has an empirical domain of interest, A, called the "object domain", and a question B regarding this domain. To answer the question, modeling includes a process of abstraction from the empirical domain A to the artificially built model A*, with the idea that the abstract entities and relations that structure the model A* are "sufficient" to answer the question on A. The following discussion refers to this definition of model..
A set V of signs (words, letters) and a grammar describing the set of all the authorized, usually infinite, structured sets of these signs (a structured set of signs is usually called a sentence). This set is usually called the language L.
A set of rules R to transform sentences into sentences. Given a subset of L, they are used to generate further elements of the language starting from this subset. In logics, this subset is called the set of axioms and the generated sentences, the set of theorems, but a sentence can also be interpreted as an initial state and the successively generated sentences as a trajectory within the L space. A function mapping the signs and sentences of the language into the domain of discourse. This domain of discourse is nothing but a model ontology, i.e. the explicit statement of what the model is talking about. Formally, an ontology in the philosophical sense is a pair <E,P> where E is a set of categorized (or typed) entities or individuals and P is a set of named properties (or qualities) and relations on E. In computer science, an ontology is usually divided into a conceptual model made of concepts or categories structured by semantic and taxonomic relations and a concrete model made of qualified objects or individuals structured by links. The same distinction can be found in descriptive logics (Baader 2003) where the formulas are divided into a terminological box (or T-Box) corresponding to the conceptual model and an assertion box (or A-Box) which corresponds to the concrete model, the former defining the vocabulary used to describe the latter. We can now define the model as a formal system as well as the mapping between this formal system and the elements of the model ontology as represented in the « Model domain » of the Figure 3. Of course this model ontology has to be related somehow to the conceptual domain ontology if one wants to discuss the relationship between the story told by the model and the conceptual story. For the Schelling case, the model could be a cellular automaton telling a story about cells having two states and transition thresholds regarding their neighboring cells. The relation to the conceptual domain is by interpreting cells as representing individuals, the two states being cultural (or racial) distinctions and the thresholds as representing the behavior of these individuals. It is only this correspondence that transforms the model simulation in a story about segregation. Additionally, the rules can be interpreted as implementations of the laws associated to the considered theory. Consequently a model domain has to refer to the conceptual domain to make explicit the modeling abstraction path. If we want to formalize the modeling process going from the conceptual to the model domain within the proposed knowledge framework, it is also necessary to propose a formalization of the ontology on both sides. The aim is then to develop an ABM ontology from the standpoint of the model-design, in order to ensure a full coherence in the model building process. These ontological elements are also subject to nomologic relationship that introduces constraints on possible operations in the resulting conceptual model (or "theory" in the broader sense used in the introduction). By convenience, these relations have been simply denoted as the "laws" corresponding to this conceptual domain (or "theory"). The combination of both ontology and theory expresses the particular conceptual domain on the empirical domain that the conceptual modeler – or analyst – extracts from the thematician’s observations. It is summarized on the abstract form of the set of entities, properties and relations constitutive of this ontology and of the set of laws constitutive of this theory. The pair <E,P> corresponds to the concrete model (or A-Box) but we shall use the full ontology definition as used in Computer Science in the following. In the conceptual domain, a theory T is a set of constraints and determinations (theoretical operations and relations or "laws") on the ontology, as a pair <C,G> where C is the set of behavioral, and possibly causal determinations and G is the set of general descriptive determinations and constraints (i.e. composition and/or conservation, accountable constraints...) expressed on the properties of the concrete entities. The conceptual domain becomes the combination of an ontology and a theory, represented by the tuple <E,P,T> as illustrated in the « Conceptual domain » of the Figure 3. Now, we can build the relationship between the conceptual domain and the model domain. The domain of discourse on which the formal system acquires its semantics, is formalized by the concrete model (or A-Box) of the model ontology. Hence the semantics of the formal system becomes the mapping of the vocabulary V of the formal system into the set E of entities or individuals. In the same way, the set R of rules of the formal system must correspond to the theory T. As a consequence, a formal system can be interpreted in many ways depending on the relationship we build with the conceptual domain. In the same way, a conceptual domain can be accounted for by many different formal systems. In this figure, we have assumed that the convergence between the ontologies of the empirical, conceptual and model domains has been ensured on the same set <E,P>. But partial convergences are possible, at first, convergence between conceptual and model domains. As mentioned in the introduction, a more general schema would consider a different ontology in each domain in order to make explicit the convergence process to be carried out between the observation, the theory and the model. Another possibility, often used in natural sciences, is to build directly models of which mechanisms are tuned to fit the observations (calibration) and to predict further observations (validation). In this case, both rule (R) and ontology (O) have not to represent necessarily an empirical process, entities or relations, but to be efficient in their prediction only, as argued by instrumentalists. In this case, the empirical ontology has to be directly related to the model ontology, e.g. defining which model parameter corresponds to which data (therefore being about the same quantity). However, in some other cases, the model itself can also be used to build a posteriori a conceptual domain. In this case, the related ontology closely matches the model content. Conversely, in the approach by the systematic knowledge framework, nomologic relations and ontology as well are used as the starting point to design models. If a model is intrinsically a formal representation, it is not necessarily the case for the ontologies and theories, hence the interest to use computer science ontologies as representations for expressing this thematical ontologies which are either almost absent in natural sciences and which are almost the only object of discourse in social and human sciences. Our emphasis on the distinctions and relations between ontology and theory can be useful if we want to take into account the role of the observer and its operations of observation on these different levels and to include it in our framework. Each level could be described and explained by a specific theory, without paying attention to emergence and interaction with the observer. The problem of emergence arises mainly when the relation between ontology of a level and the theory of another level is a problem for the observer. He could have two theories, one for each level, but with different ontologies: molecules of water on the one hand, clouds and storms on the other; inhabitants on the one hand, urban quarters on the other. The problem is then to connect theoretically the two ontologies. When reduction is possible (temperature and pressure in a gas are reduced to the average celerity of molecules) the explanation of the connection requires to take into account a change in the observer’s point of view: from the observation of one molecule at one moment to a much longer observation in which the stability of the gas on a larger interval of time is assumed (for averaging). This small change of scale hides an ontological component still not theorized, which is related to the change of the type of interaction between the observer and the system (most of the time, the shift of the observer’s point of view implies also a temporal shift). In the case of the gas the ontological shift can be reduced to the combination of taking a larger interval and averaging, but this would be inadequate in some other situations. The observer -in Schelling’s matter - may also have a theory of the micro level (interactions between agents reactive to their neighborhood), while his ontology at the macro level is a sociological one (cultural communities). When rational expectations economics give to the agents the knowledge of the model itself (i.e. for anticipating the prices on the Stock Exchange Market), they change each agent into an observer for his own. It seems that the observer’s point of view has been integrated into the model and the theory. But at the same time they do not assume that they are (ontologically) observers with such impressive informational properties as the ones of their agents, and this difference remains to be theorized. In the literature, the notion "emergence" is often subdivided into types, for example: "nominal", "weak" and "strong" emergence for (Bedau 1997, 2002), or "weak" "ontological", and "strong" emergence for (Gillet 2002a-2002b). Stephan (2002a, 2000b) discuss the difference between weak and strong forms of emergence in a larger framework, using the difference between "synchronic" and "diachronic" emergentism. Roughly, both downward causation and irreducibility are generally considered as necessary conditions for strong emergence, but the definition of weak emergence remains unclear, and/or depends on the field and the author as well. For our concern, we only briefly quote the simulation-related definition of Bedau. (see Dessalles, Müller and Phan 2007 and Dessalles, Ferber and Phan 2008 for a more detailed discussion on this subject). Bedau call "nominal" emergence the case where "a macro-level phenomena "emerges" in a bottom-up process from the interaction of micro-level entities, but become autonomous from underlying phenomena; in the straightforward sense that emergent properties do not apply to the underlying entities" (Beda 2002). In other words, emergent properties do not have a causal power on lower level entities. Strong emergence is then the opposite of nominal emergence, when emergent properties have irreducible causal power on the underlying entities. Weak emergence is a subset of nominal emergence for which the emergent phenomenon is not easy to explain and need to be simulated to be revealed : a "macrostate P of S [system] with microdynamic D is weakly emergent iff P can be derived from D and S’s external conditions but only by simulation" (Bedau 1997). These definitions seems a little confused, because its mix considerations from the phenomena itself (causation, with opposition between "nominal" and "strong") with epistemic conditions from the observer point of view (i.e. derived "only by simulation"). In the Social Sciences field, Gilbert (2002) put the emphasis on methodological problems linked with various forms of emergence in social simulation such as social recognition, construction of categories and second order emergence (also called "immergence" by Gilbert (1995). This form of "second order emergence" result from the ability of reflexive agents (i.e. like humans in society) to identify and react to emergent features, then, to induce downward causation. Sawyer (2004, 2005) considers the non-reductibility of the social level to the individual (in a "non reductive individualism" perspective) as a key condition for emergence, and uses the notion of supervenience to identify "emergent social properties", which "cannot be reduced to an explanation in terms of individuals and their relationships". According to the terms of the philosophical debate on non-reductive physicalism, Sawyer argues that both multiple realizability (when a single social property can be generated by several micro-level mechanisms) and wild disjunction (when these mechanisms are not meaningfully related) are necessary and sufficient conditions for emergence of non reducible social properties. Sawyer’s conception of emergence has been criticized by Bunge (2004). For this author, the relevant notion of emergence is diachronic and relative to a given system. As emergence is often defined as "the rising out of a qualitative novelty", this new property appears for Bunge "at some point in the development or the evolution of the system". In contrast, supervenience: "does not use the concept of system and levels of organization" (Bunge 2004, p. 377-78). This diachronic dimension of social emergence is decisive in the Social Sciences: according to Archer (1995), social structures have emerged in the past from actions of agents (bottom-up), but continue to exert effects in the present (top down). In many cases structures remain active even though the causal micro-determinants of their emergence do not. This resolves in practice many logical paradoxes of chicken-egg type. Both Gilbert’s and Sawyer’s typologies of emergence raise interesting questions, but do not provide a formal framework to deal with emergence when Muller (2004) and Bonnabeau and Dessalles (1997; Dessalles and Phan 2005) try to do it. In a complementary way, Bonnabeau and Dessalles (1997) introduce an observation-related measure of the emergence as a complexity reduction in the observational system (CROS). More specifically, the strength of the emergence E is quantitatively defined as the difference between the expected complexity in the description of the system before emergence detection, and its actual, observed complexity after detection (Dessalles, Müller and Phan 2007) Complexity here means cognitive – or epistemic – complexity, i.e. the size of the smallest cognitive description of the system that is available to the observer. This definition is compatible with another conception called emergence-relative-to-a-model (ERM) by Bonabeau and Dessalles (1997) by reference at Cariani (1991) and Rosen (1985). For ERM, there is emergence in an object domain (in a natural phenomena for the authors) when the former model (and implicitly the related ontology) of this object domain cannot longer to explain the observed phenomena, that requires a new model in order to be explained. In other world, there is a multi-level hierarchy of model, in which a higher-level model subsumes lower level models. 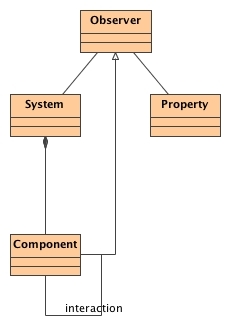 To shift from a model to another the modeler either has to (1) find new relationship between existing entities (and corresponding attributes – i.e. variables), or (2) find new entities (observables in a phenomenological approach, that allow the modeler to define new variables). The former, which need new combinatorial abilities between entities is said to correspond at a "syntactic" form of emergence, while the later is said to correspond at a "semantic" form of emergence. Both correspond to a change in ontology, by means of a re-design of relevant relationship between system’s entities on the one hand, or by the redesign of the system’s entities on the other. Although ERM is related both with model - conceptual domain(s) an empirical domain, (i.e. the shift in model can be viewed as the consequence of theorizing of some novelty in the empirical domain), the CROS approach could be viewed as a simple "new categorization" or "new conceptualization" in the conceptual domain, that could be absolutely independent of the occurrence of an emergent phenomenon in the empirical domain. Figure 5 : An other point of view on weak / strong emergence with respect to the couple: observed process / process of observation. Coupling more systematically the observed process with the process of observation itself, like suggested by the Müller (2004) framework, is necessary to distinguish "real" emergent phenomenon from a purely cognitive issue (i.e. purely internal to the observer point of view). The possible differences among the ontologies of various theories can be better understood: (1) as resulting from different kinds of emergence; (2) as a formalization of these differences. This allows us to distinguish "weak" and "strong" forms of emergence, but also distinguish two kinds within these categories (Figure 5). Weak emergence is relative either (a) to a shift of the observer’s point of view that could be theorized without really new concepts (gas: the ontological shift of interaction can be theorized just by a shift in time and averaging). Let us call that Weak Observational Emergence (WOE): the ontological difference can be reduced. Or (b) to the fact that the observation at the higher level, done by an observer external to the system, is coarse-grained and captures only global regularities. As a consequence, the high level ontology is more coarse-grained than the one implied by the model or the theory at the micro level, the better theory is the micro one. Let us call that Weak Ontological Observational Emergence (WOOE). The ontological difference is still not reduced. WOOE differs from WOE by the assumption of a duality of ontologies, still in need of theorization, while WOE uses the same basic concepts and ontology but at different observational levels. WOE is only a phenomenal emergence, related to a shift in perspective from the observer. WOOE implies a duality of ontologies, but the precise ontologies have still to be built. WOOE is still a weak form of emergence, because the lower level ontology is assumed to be the more explicative one (no downward causation is assumed or required) –we represent only WOOE, as we are concerned in differences between ontologies. Stronger forms of emergence imply: (a) that the difference between the access to the macro level and the one to the micro level cannot be reduced to the same kind of interaction as the one of the micro level: the two kinds of interaction have to be theorized separately, building a global system including the observer’s point of view. 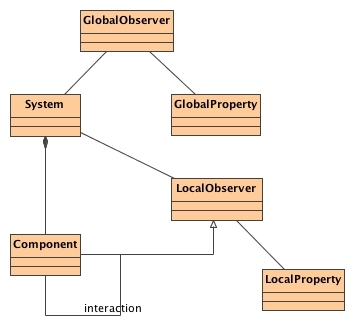 This is not needed in WOE, as the interaction with the observer uses the same concepts as the interaction within the system. These separated theorizations and how to relate them are not given in WOOE. As the interaction with the observer at a higher level is an interaction with the system, we can speak of Relative Strong Emergence (RSE), where "relative" means "relative to a given system". RSE could involve an a-reflexive kind of "immergence" (i.e. individual interactions are informed by a global state of affairs, as for Gilbert (2002) and Castelfranchi (2006). Or: (b) it may imply the more demanding property that inside observer’s points of view are theorized in the system: as these inside observers can react to their representation of the whole system, the whole system that emerges from their interactions can bring forth downward causation on their behavior. Of course, this whole system and its downward causation have to be observed by a third observer (Figure 4c). We could call it: Systemic Strong Emergence (SSE). Second order emergence (how to design not the agent system but the conditions for such an agent to self-constitute) implies to theorize the relation between an immergent system and the constitution of its agents. It can be seen as a problem inverse of designing a reflective representation from the viewpoint of the agent. This contribution is a first overview of questions linked to simulation models’ ontology and proposes some lines of research which should be usefully deepened in the future. Our aim was to show that ontology can be used as a benchmark (for the case of an ontology common to different theories) or as a formal framework allowing more direct comparisons: between formal reconstructions (in the case of several ontologies for several theories, of several ontologies for a previously supposed unified theory), or between simulations and thematic domains. Formulating ontological commitments makes possible to show what are the implied assumptions and implicit presuppositions, in particular when we are dealing with multi-scalar phenomena and emergent ones. In this last case, we have to take into account, among the ontological conditions of emergence, as ontological processes and operations, the ways by which the observer can have an observational access to phenomena. The structure of emergence involves the whole set including these observational processes, the interactions between basic elements, and the emergent structural properties. AMBLARD, F., Bommel P. and Rouchier J. (2007) "Assessment and validation of Multi-agent Models", in Phan, Amblard. (2007) op.cit. p. 93-114. BAADER, F. (2003) "Description Logic Terminology",in: Description Logic Handbook Theory, Implementation, and Applications Cambridge University Press, p.485-495. BEDAU,, M.A. (1997) Weak Emergence, Noûs, 31, Supplement: Philosophical Perspectives, 11, Mind, Causation, and World, p. 375-399. BOMMEL, P. and Müller J.P. (2007) "An Introduction to UML for Modelling in the Human and Social Science", in Phan, Amblard. (2007) op.cit. p. 273-294. BONABEAU E., Dessalles J-L. (1997) "Detection and emergence", Intellectica, vol. 25, pp. 89–94. BUNGE, M. (2004) "Clarifying some misundetstandings about social systems and their mechanisms", Philosophy of the Social Sciences, Vol 34, 2 June, pp. 371–281. CARIANI, P. "Adaptivity and emergence in organisms and devices", World Futures 31, Gordon & Breach Science Publishers, 1991, p. 49-70. CASTELFRANCHI, C. Cognitive architecture and contents for social structures and interactions. In R. Sun (Ed. ), Cognition and multi-agent interaction: From cognitive modeling to social simulation. Cambridge, Cambridge University Press 2006. DESSALLES, J.L. and Phan D. (2005) "Emergence in multi-agent systems: cognitive hierarchy, detection, and complexity reduction part I: methodological issues", in Mathieu, Beaufils, Brandouy(e), Agent-Based Methods in Finance, Game Theory and their Applications, Series: Lecture Notes in Economics and Mathematical Systems, Vol. 564 Springer, p. 147-161. DESSALLES, J.L. and Ferber J and Phan D. (2008) "Emergence in multi-agent systems: review of conceptual and methodological issues for the application to the social sciences", Shan Y., Yang A. eds. Intelligent Complex Adaptive Systems, Idea Group Inc.
FERBER, J. Multi-agent Systems: an Introduction to Distributed Artificial Intelligence, Addison Wesley Reading, MA, 1999. FERBER, J. "Multi-agent Concepts and Methodologies", in Phan, Amblard. (2007) op.cit. p. 7-34. GILBERT, N. (2002) "Varieties of emergence", Paper presented at the Agent 2002 Conference: Social agents: ecology, exchange, and evolution, Chicago. GILBERT, N. and Conte R. Eds (1995), Artificial Societies : The Computer Simulation of Social Life, London UCL Press. GILLETT, C. (2002a) "The Varieties of Emergence: Their Purposes, Obligations and Importance", Grazer Philosophische Studien, 65, p.89-115. GILLETT, C. (2002b) "Strong Emergence as a Defense of Non-Reductive Physicalism: A physicalist Metaphysics for 'Downward' Determination", Principia 6(1) June, special issue on Emergence and Downward Causation, p.83-114. GRUBER, T.R. (1993) "Toward principles for the design of ontologies used for knowledge sharing", in N. Guarino and R. Poli, (Eds. ), International Workshop on Formal Ontology, Padova, Italy. Published in International Journal of Human-Computer Studies, Volume 43(5-6), 1995, p 907-928. HALES, D. and Edmonds B. and Rouchier J. (2003) "Model to model analysis", Journal of Artificial Societies and Social Simulation, vol.6, n°4. LIVET, P. (2007) "Towards an Epistemology of Multi-agent Simulation in Social Science", in Phan, Amblard. (2007) op. cit . p 169-194. MINSKY L, M. (1965) "Matter, Mind and Models", Proceedings of IFIP Congress, p. 45-49. MÜLLER, Phan Varenne, (2009) "An ontological perspective on the action – structure debate for agent-based framework: the case of "following a rule" XVI èmes rencontres de Rochebrune, Rencontres interdisciplinaires sur les systèmes complexes naturels et artificiels "Ontologie et dynamique des systèmes complexes, perspectives interdisciplinaires", Megeve, 19-23 january 2009. PHAN, D.and Amblard F. Eds (2007), Agent-based Modelling and Simulation in the Social and Human Sciences, Oxford, The Bardwell Press. PHAN, D. and Schmid A-F. and Varenne F. (2007) "Epistemology in a nutshell: Theory, model, simulation and Experiment" in Phan, Amblard. (2007) op. cit., p. 357-392. ROSEN, R. (1985) Anticipatory Systems, Pergamon Press. SANDERS, L. (2007a) "Agent Models in Urban Geography", in Phan, Amblard. (2007) op.cit. p. 147-168. SCHELLING, T.S. (1978) Micromotives and Macrobehaviour, N.Y Norton and Co.
STEPHAN A. (2002b) "Emergence" in: Nadel (ed.) Encyclopedia of Cognitive Science. Vol. 1., London: Macmillan, 2002, p.1108-1115. SMITH, B. (2003) Ontology, in Floridi L. (ed. ), Blackwell Guide to the Philosophy of Computing and Information, Blackwell, Oxford, p.155--166. SUPPES, P. (1989) The Semantic Conception of Theories and Scientific Realism, Urbana, University of Illinois Press. TESFATSION, L. and Judd K.L. (2006) Handbook of Computational Economics, Vol. 2: Agent-Based Computational Economics, Amsterdam, New York, Elsevier North-Holland.